The Old Days: For early homesteaders, the fall harvest was a busy time of year. 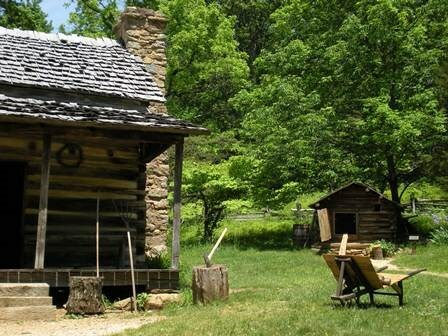 You can experience a bit of this history at Humpback Rocks Farm (milepost 5.8 near Shenandoah National Park), https://www.nps.gov/blri/planyourvisit/visitorcenters.htm, where rangers and volunteers offer demonstrations and talks that illustrate what life was like for early mountaineers. Sleep Under the Stars: The campgrounds in the park close for the season on October 28, but you can still enjoy a crisp evening under the stars at Explore Park (milepost 115 at Roanoke). The park recently added primitive sites, yurts, tepees, canvas tends, and pod cabins for overnights stays. To make reservations, visit https://www.roanokecountyparks.com/. Apple Picking Time: Don’t miss a visit to The Orchard at Altapass (milepost 328 near Sparta, NC), where you can roam the hillside to pick your own heirloom varieties of fruit or purchase them at the store. Visit https://altapassorchard.org/ for details. Typically, throughout October, you can expect to find good fall color along the Parkway. Leaves will begin changing first on the highest peaks and conclude on the lower elevations. Fall colors are often more vivid in cloudy weather than on sunny days. Leaves on smaller saplings and shaded trees stay green until the leaves of the taller, more exposed trees have changed color and fallen. Thank you Blue Ridge Parkway Foundation for contributing the content of this post.